This blog is going to be all about Hair Removal yayyyyy. I will never forget when I first met Maria, at Lynton Lasers (For those of you who don’t know, Lynton is who I bought my machine from and Maria helped me with my launch party and the marketing of my clinic when I first started). And at my launch party Maria said “I haven’t picked up a razor since 1996”…. Imagine that! When I speak to potential clients about hair removal, the main questions I get asked is, is it painful? Is it permanent? And the other thing I hear all the time is that it doesn’t work? So for me, my main challenge is more about education. 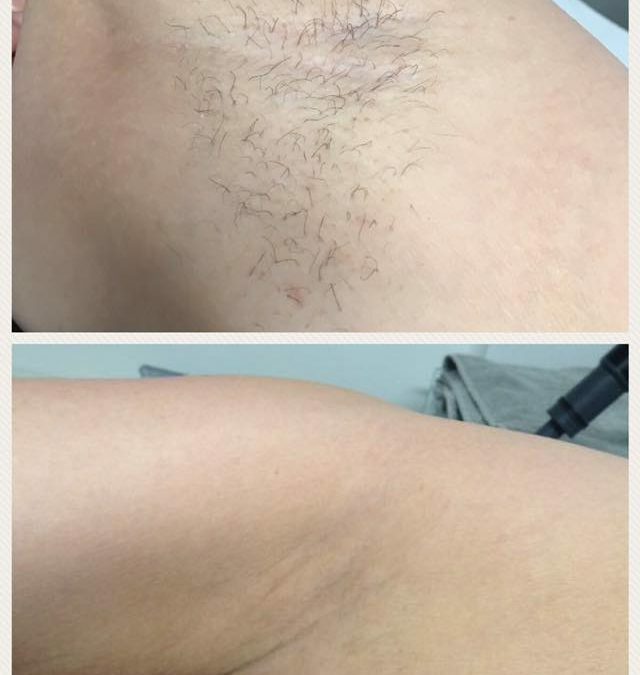 Educating people on exactly what Hair Removal is all about, so here goes! The sensation varies, however it is often described as an elastic band ping, each individual laser shot is a ping. It shouldn’t be so painful that you don’t want to come back for your treatment and on the scale of 1-10, on average you should be between 2-5 out of 10, no greater than 7, and this can also vary or body part. No anaesthesia is required and most clients describe the discomfort as moderate and tolerable. IPL hair reduction is permanent, the hairs which are destroyed during your treatment will never return. Your skin does however contain dormant hair follicles, so it is possible for new hairs to appear during the growth cycle. (although these will be much finer than your original hairs). There are several other factors such as hormonal imbalances which can also affect the overall results, in these cases, several treatments may be necessary. You may also smell burning hair throughout your treatment, please don’t panic, I will have a little skip and a little hooray as this tells me we are killing and destroying those hairs. All hair colours can be treated apart from white or grey hair. The laser reacts to the pigment in the follicle, so darker the hair colour the better. In the consultation I will need to see your hair as the precise wavelength of the light will be tailored to your hair colour to achieve the best results. The treatment time varies depending on the part of the body being treated. Typically face (lip and chin) 15-20 minutes, full legs takes 1 hour, underarms take 10-15 minutes, toes take 5-10 minutes. As IPL hair reduction works by heating up the pigment within a hair, epilation, plucking and waxing should be avoided up to 4 weeks prior to your treatment. Shaving is fine in between treatments as you are leaving the follicle within the skin. Initially for the consultation and patch test I would need to see hair in the area, to identify the colour of the hair and the density, once this has been done, I would then shave the area to do the patch test. When you come in for your treatments, I would ask that you shave beforehand. I don’t want there to be any hair in the area when it comes to your treatment. You should avoid tanning and exposure to UV light 3-4 weeks before your treatment and if you have been on holiday and exposed to sunlight you would need to wait 4 weeks once you are back in order for your melanin to settle. You must not have any tan in the area fake or real. IPL hair reduction is perfectly safe so other than protective glasses, no other special precautions are needed. The skin may be red immediately after treatment and the hair follicle may be swollen and bumpy but this usually subsides within a few hours. Adverse reactions are rare such as blistering or temporary lightening or darkening of the skin. The treatment is non-invasive so most clients experience no side-effects at all. Only hair that is actively growing is affected (Anagen stage) therefore multiple treatments are needed as every hair is on a difference hair growth cycle. Treatment is conducted every 4-6 weeks on the face and every 6-8 weeks on the body. The required number of treatments varies due to several factors such as individual’s growth cycle, area of the body, hair density, thickness, ethnic origin, hormone state and age however, typically you are looking at 8-12 sessions for the hair to be gone completely. Most clients need no post-treatment care, if you have sensitive skin, you may benefit from applying an aloe vera based product to the treated area of your skin for a few days after your treatment. I also advise that you avoid direct sunlight exposure to the treated area for a few weeks following your treatment and yes… that does mean sunbeds also! and I would also recommend using factor 30-50 sunscreen. IPL stands for intense pulsed light, and it is a form of light therapy, used for various dermatological procedures including hair removal. I also use IPL for Skin Rejuvenation, Pigmentation and the removal of vascular veins, rosacea and acne. Light is selectively absorbed by melanin, the pigment in the hair follicle. The light energy heats the pigment within the hair and effectively destroys the hair follicle, preventing it from growing back, without damaging the surrounding cells. IPL hair removal is permanent. The hairs that are removed during treatment will not return. It is worth noting that due to the normal hair growth cycle, it is possible for dormant follicles to become active. These will be finer than the original hairs though. And I guess the main question is does it work? Absolutely! But don’t hear it from me, hear it from my clients; please take a look at my photos on Facebook and Instagram and also my reviews. The results speak for themselves and my clients are just over the moon. Ok, so I think I have answered most of the common questions I am asked, do you have any other questions? If you have, I do offer free consultations and I really encourage you to come in beforehand. Consultations last about 30 minutes. Or you can send me an email or message me directly on social media.